PhA efflux in MDCKII-BCRP cells. Concentration-dependent inhibition of BCRP/ABCG2 by elvitegravir and vicriviroc. Each curve depicts one representative experiment of a series of three or four; each concentration was tested in 30000 cells. J Antimicrob Chemother 2011 66, 802-812. Elvitegravir (GS-9137, JTK-303) purchased from Selleck. mdr1a/b and ABCB1 inhibition measured by calcein assay. Concentration-dependent effects of elvitegravir and vicriviroc on calcein accumulation in P388/dx cells (a) and L-MDR1 cells (b). Each curve depicts one representative experiment of a series of three or four. Data are expressed as means+SEM. Effect of antiretrovirals and positive control rifampicin (at 10 μmol/L) on ABCB1 function in LS180 cells after 3 and 7 days (d) of treatment. ABCB1 function was normalized to the medium control. Data are expressed as means+SEM for n¼4. **P<0.01. Functional windows of antiviral drug action. (A) At the indicated times, 10-fold EC95 adjusted levels of RAL, EVG, AZT, or NVP were added to HIV-Luc-infected cultures. Cells were lysed at 48 h postinfection, and luciferase activities are expressed as the percentage of the response in non-drug-treated cells. (B) Results of an experiment similar to that in panel A, except cells were treated with 10 the EC95 of RAL, 100 the EC95 of RAL, 10 the EC95 of EVG, or 100 the EC95 of EVG at the indicated times. Numbers indicate the time (in h) required for 50% inhibition compared to the no-drug control (dashed lines). Antim Ag Ch 2011 55, 42-49. Elvitegravir (GS-9137, JTK-303) purchased from Selleck. HIV-Luc was preincubated with the indicated level of drug for 1 h prior to 2 min of MNP-mediated infection. Extensively washed cultures were incubated in the absence of drug for 2 days prior to cell lysis and luciferase assays. 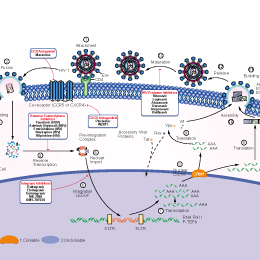 The NN-luc control virus was omitted from the virucidal activity assays. Cells were treated with the indicated concentrations of Elvitegravir. 2010 Dr. Johanna Weiss of University Hospital Heidelberg. Elvitegravir (GS-9137, JTK-303) purchased from Selleck. Shimura K, et al. J Virol. 2008, 82(2), 764-774. Lampiris HW. Expert Rev Anti Infect Ther. 2012, 10(1), 13-20. 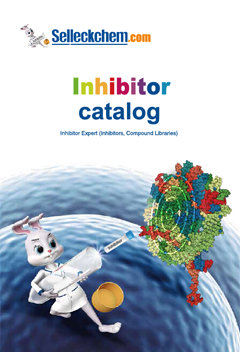 Features:The 1st approved human immunodeficiency virus type 1 (HIV-1) integrase inhibitor.